Celebrate with your friends before the lucky guy ties the knot! Every season is Nashville bachelor party season. Grab drinks, your buds, more drinks, and let this crazy weekend commence. 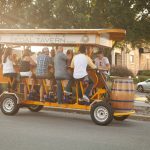 While we consider our Nashville party bike tours to be the definition of an epic bachelor party, Nashville has something for every type of bachelor – conquer the great outdoors, or live it up all night long in the city. It will be a bachelor party y’all will (hopefully) remember for years to come. Give in to your primal hunting instincts and give ax throwing a go! Ax throwing is the newest sport of skill and aim, which is popular in Canada and is making its way quickly through the U.S. Throw axes that range from full-length woodcutting axes to smaller, hand-held tomahawks and enjoy an experience unlike any other in Nashville. The Code Word is: WHISKEY. Duration: About an hour and 15 minutes drive from Nashville. Total tour time 1+ hours. This Nashville bachelor party activity is a great way to enjoy the best part of golf – drinking and sitting. Top Golf has finally made it’s way to downtown Nashville! The latest golf game challenge, where you don’t need to anywhere near a pro! Stay as long or as little as you would like, hang out in your very own Bay, and enjoy amazing food and beverages overlooking the Nashville scene. What’s the best way to amp up your bach team for a night on the town? A whitewater adrenaline rush. The Middle Ocoee River is the most popular whitewater rafting trip in the country. This is in most part due to hot days, consistent dam released flows and awesome whitewater. Let your group feel on top of the world before the rest of the bachelor party sends them overboard. Time to brush up on your secret agent skills. With sixteen lanes of indoor rifle or pistol shooting on the most advanced wireless target system available you can be sure that it will be an unparalleled shooting experience. Learn to shoot, become a spy, shoot the bad guy, get the girl right? Your Nashville bachelor party deserves some class and style. Get your Winston Churchill on. BLEND Bar with Davidoff Cigars is located in the heart of downtown Nashville, a city known for country music, its rich history, and one of our favorite things–bourbon. Whether you are in the Nashville area to visit landmarks–like The Grand Ole Opry and the Ryman Auditorium–or are a Nashville native, visit us on Church Street to enjoy the BLEND experience. We said it in the beginning and we’ll say it again – we are Nashville’s experts in all things Bachelor party. Our two-hour Nashville bar crawl includes exclusive drink specials for you to take advantage of from our partners. You can hit up all the best honky-tonks in Broadway and beyond. We’ll give you an insider tip though – if you have a specific day in mind for your tour, especially a weekend, try to book at least a month in advance – the trips are booked up fast! Ready to plan an epic Nashville bachelor party? Book a private tour with Nashville Pedal Tavern today!